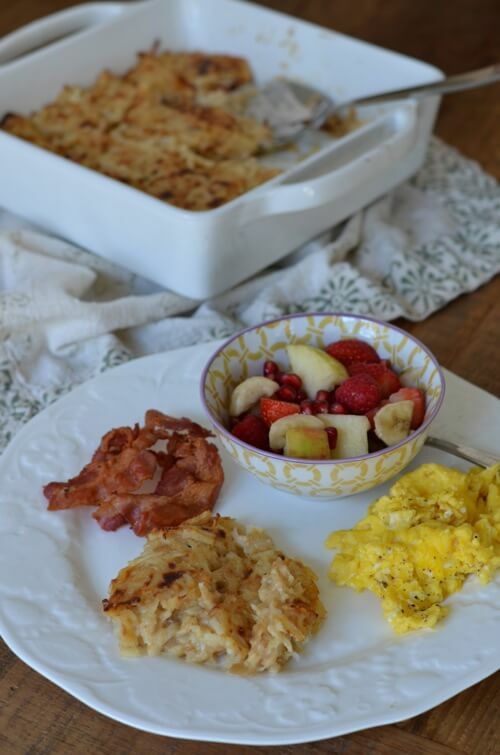 Welcome to the world of Cheesy Hash Brown Casserole goodness! I used to LOVE the Hash Brown Casserole at Cracker Barrel. That’s before I started asking questions about how they make their food (did you know almost all of their vegetable side dishes are made with sugar?). Then if you look at the copy cat recipes online, most of them call for a can of condensed soup – no thank you MSG and other unwanted additives! There has to be a better way, and thankfully there is, which I’ve detailed for you below. It’s hard to go wrong when it comes to potatoes and cheese and other wholesome ingredients. This is a tasty dish that you can enjoy with breakfast, lunch or dinner! Preheat the oven to 350 degrees F. Grease a square baking dish with butter (8 x 8 or 9 x 9 inch) and set aside. In a large sauté pan over medium heat melt the butter. Cook the diced onion until it softens but does not brown, about 2 to 3 minutes. Throw in the minced garlic and cook while stirring for 1 more minute. Turn the heat down to medium low and whisk in the flour. Continuously stir until the flour darkens but is not burnt, about 1 to 2 minutes. Whisk in the milk, salt, and pepper until it slightly thickens, about 1 minute. Turn the heat off and, using a spatula or wooden spoon, stir in the grated cheese until it melts. Fold in the hash browns until evenly coated. Transfer to the baking dish being careful to push the thick mixture down on top into one even layer. Bake for 30 to 35 minutes uncovered, and then turn the heat up to broil for 3 to 4 minutes or until the top turns golden brown. Keep a close eye under the broiler so it doesn't burn! Serve warm and enjoy. Previous Post: « The Best Pulled Pork in a Crock Pot! My family loves this recipe. I used half the butter and added frozen tricolored peppers. Best thing ever! Love this recipe! I wanted to make it more of a meal, so I start off by cooking a pound of ground beef or sausage and then add everything else using 4 TBSP of butter instead of 6. My family loves it and it has become a weekly staple! Thank you! to cleanly go indoors instead, including indoor pet potty grass. country haven’t really learned their lessons as well as Florida has. Season Five of Stargate Atlantis completes a great story arc which began in Stargate SG1. Hello. Yes, other readers have frozen it prior to baking. Can you make this ahead, like the night before and heat and serve in the morning? Can you make this with grated potatoes? It looks delish, but I don’t have frozen hash browns. Lisa had better success with the frozen potatoes..
Where have you found 1 ingredient hash brown potatoes? I’ve not been able to find them at either Earth Fare and Whole Foods in Southpark. Help! Cascadia farms has a one ingredient frozen hash brown.. Thank you for the information! I really appreciate it. I made this dish & although it was tasty, it was incredibly greasy. Anyone else have this problem? I wouldn’t say it’s “just like Cracker Barrel’s”. It’s more like Mac and Cheese made with frozen hash browns instead of macaroni. 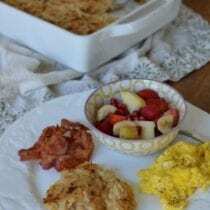 Tasty, but not as close as other copycat recipes of Cracker Barrel Hash Brown Casserole. Definitely needs the sour cream that’s missing from the above recipe! The original may not but many do have sour cream that claim to copycat cracker barrel. I’ve seen the creamed soup also listed on many. I figure the sour cream would make it creamer like the soup. Either way just suit to your taste. The sour cream sounds like a great addition! Cracker Barrels recipe does not have sour cream in it. Could you prepare night before & then bake in the morning? Hello. I think it would work fine the next day. I prep the night before and bake it Christmas morning. Comes out great! Could you substitute dairy free cheese? Hi. That is not something we’ve tried. I have and it works great! This was even better than I expected! I had frozen hashbrowns and wasn’t sure what to do with them and then I came across this recipe. Even my husband, who normally doesn’t like hashbrowns said these were some of the best potatoes he’s ever had. So easy to put together and I was very happy to NOT see sour cream in the ingredients (I didn’t miss it at all) – I will definitely be making this again! !